Say the words “Oz the Great and Powerful” out loud and I promise you’ll smile. They conjure up so many wonderful, wizardly things: Judy Garland in pigtails (before that horrible tightness set in); Ray Bolger pointing at his straw head; Bert Lahr’s juddery fisticuffs; the madly cheerful munchkins; “Toto, too”; and, if you’re old enough, the once-a-year Thanksgiving television showing that spurred so many Americans to shell out finally for color sets. 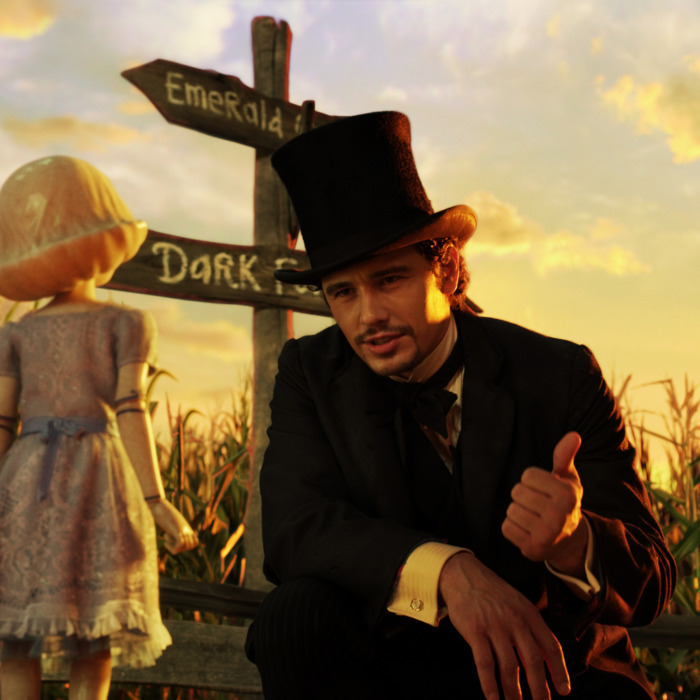 Make sure to say those words before you see Disney’s Oz the Great and Powerful, which will surely wipe the smile off your face. No, the movie is not a desecration — there wasn’t enough left for Disney to desecrate after the Warner Bros. legal team got through threatening copyright infringement. (L. Frank Baum’s Oz books are in the public domain; the 1939 Garland musical isn’t.) But aside from a trio of witches that can hold its own with Eastwick’s in the dishiness department, Oz the Great and Powerful is a peculiarly joyless occasion. That’s an extra shame because the premise is good — more in line with Mark Twain’s prankish A Connecticut Yankee in King Arthur’s Court than anything Baum came up with in his thirteen subsequent Oz books. The idea is to go back to a time before Dorothy and chart the journey from Kansas to Oz of the “wonderful” wizard himself — here called Oscar Diggs and played by James Franco as a traveling carnival magician who applies himself most diligently to the trick of getting women to sleep with him. The black-and-white Kansas prologue is a treat, not because it’s especially witty but for what it portends. Long ago, director Sam Raimi was an adolescent Super-8 filmmaker with a talent for handmade special effects, and he obviously relishes Oscar’s primitive sleight of hand, that mixture of honest showmanship and flimflam. But I can’t imagine Raimi had much say about the characters that come onboard once Oscar is carried off in a hot-air balloon by a funnel cloud — once the screen widens, the color seeps in, and we meet the talking flying monkey (with the grating voice of Zach Braff) and sassy little China Doll. The banter is from hunger (despite a script co-written by playwright David Lindsay-Abaire), and Franco is the least convincing actor I’ve seen addressing creatures to be computer-generated later. Franco is unconvincing generally, tamping down the passion, ironicizing everything out. It wouldn’t take much to energize this chiseler, who meets the lovely young witch, Theodora (Mila Kunis), and pretends to be the wizard foretold by a vision who will free Oz from enslavement — partly to seduce her, partly to gain access to the kingdom’s stores of gold. Songs would have helped get this lead balloon off the ground (imagine The Wizard of Oz without the numbers), but I’m guessing Disney didn’t want to draw any more comparisons to Victor Fleming’s 1939 classic. But the movie needs some kind of wild card, some chance for Raimi to show the mischievous exuberance (if not the gore) of The Evil Dead or the soul of Spider-Man 2. The shrieking, clawing gypsy of his Drag Me to Hell who spews bodily fluids all over the heroine’s car would have taught these witches of Oz a spell or two. Kunis is a charming comedienne with an eager, open face (her breakout turn isn’t in Oz The Great and Powerful but in her widely viewed London junket interview with a wannabe Hugh Grant), but she’s out of her depth in a role that requires her to go from impossibly naïve to mythically vindictive — especially without good lines. But Weisz’s Evanora and Williams’s Glinda are deliciously stylized creations. Weisz is all crisp and insouciant — until she shows her fiendish spirit. Williams gently sends up Glinda’s beatific aura while remaining radiantly blonde and pure. The two of them have the best scene, in which Evanora gets a palpable kick out of torturing the good witch before the populace of Oz. It’s nastier than the rest of the movie — and the first time the actors look as if they’re enjoying themselves. It’s also a rare scene without Oz the Small and Muddled.